With the born storyteller's command of narrative and imaginative approach, Leonard Mlodinow vividly demonstrates how our lives are profoundly informed by chance and randomness and how everything from wine ratings and corporate success to school grades and political polls are less reliable than we believe. By showing us the true nature of chance and revealing the psychological illusions that cause us to misjudge the world around us, Mlodinow gives us the tools we need to make more informed decisions. From the classroom to the courtroom and from financial markets to supermarkets, Mlodinow's intriguing and illuminating look at how randomness, chance, and probability affect our daily lives will intrigue, awe, and inspire. The hidden role of chance . . . when human beings can be outperformed by a rat. The basic principles of probability and how they are abused . . . why a good story is often less likely to be true than a flimsy explanation. A framework for thinking about random situations . . . from a gambler in plague-ridden Italy to Let’s Make a Deal. How to count the number of ways in which events can happen, and why it matters . . . the mathematical meaning of expectation. The extent to which probabilities are reflected in the results we observe . . . Zeno’s paradox, the concept of limits, and beating the casino at roulette. How to adjust expectations in light of past events or new knowledge . . . mistakes in conditional probability from medical screening to the O. J. Simpson trial and the prosecutor’s fallacy. The meaning and lack of meaning in measurements . . . the bell curve and wine ratings, political polls, grades, and the position of planets. How large numbers can wash out the disorder of randomness . . . or why 200,000,000 drivers form a creature of habit. Why we are often fooled by the regularities in chance events . . . can a million consecutive zeroes or the success of Wall Street gurus be random? Why chance is a more fundamental conception than causality . . . Bruce Willis, Bill Gates, and the normal accident theory of life. 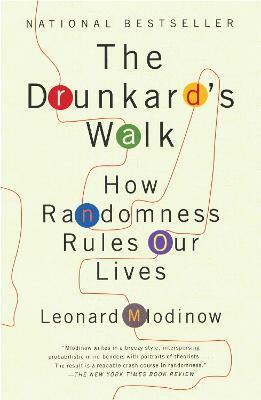 Leonard Mlodinow received his doctorate in physics from the University of California, Berkeley, was an Alexander von Humboldt fellow at the Max Planck Institute, and now teaches about randomness to future scientists at Caltech. Along the way he also wrote for the television series MacGyver and Star Trek: The Next Generation. His previous books include Euclid's Window: The Story of Geometry from Parallel Lines to Hyperspace, Feynman's Rainbow: A Search for Beauty in Physics and in Life, and, with Stephen Hawking, A Briefer History of Time. He lives in South Pasadena, California. From the Hardcover edition.